Not sure if your noise old bathroom exhaust fan is working well? Give it the ‘ole tissue test to find out! Hold a single tissue up to your bathroom fan and if it suctions to the fan and does not fall away, you are getting good air moment. 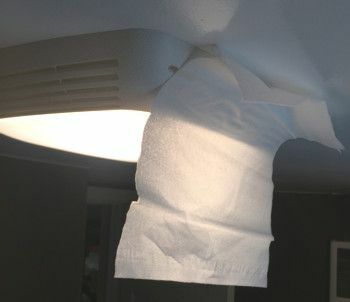 If the tissue does not hold, then you will want to investigate why the fan is being so inefficient. How can you improve efficiency of your exhaust fan? You can start with vacuuming out dust and dirt that may be clogging the fan or the screening. Next, you can remove the screen and make sure that their is no loss of suction being caused by open ports around the housing. It is important to fill in all of these gaps with spray foam (or similar) to ensure that the fan is drawing air from the bathroom and not the attic space above. Lastly, you will want to make sure that the vent leading to the outside of the house is working properly. This will require making sure the flap on the unit is opening up when the fan is in use and closing when it is not. This tip was brought about from personal experience with my bathroom fan that has been recently upgraded by sealing off around the housing and cleaning out the fan screening! If there is a helpful tip or some topic that you would like us to mention in our blog, please feel free to email me at derek@rolliers.com.